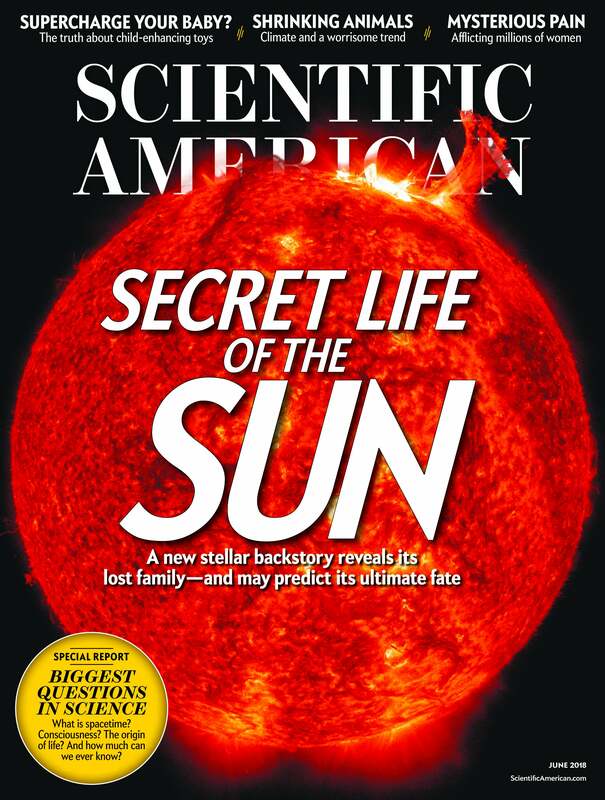 Editor’s Note (11/12/18): Scientific American is re-posting the following article, originally published June 1, 2018, in light of devastating wildfires that have been raging in California since Thursday. The horrific Tubbs Fire in California's Sonoma and Napa counties last October tore through more than 36,000 acres, killing 22 people and destroying nearly 6,000 buildings. It was the most destructive wildfire in the state's history in terms of structures lost, according to the California Department of Forestry and Fire Protection. Half a century earlier the Hanley Fire burned some 53,000 acres along a nearly identical path. Although that blaze remains Sonoma County's largest on record, it destroyed only a few dozen structures, most of which were homes. The main difference between then and now is the expansion of what researchers call the wildland-urban interface, or WUI: the area where houses sit within or directly adjacent to natural vegetation. The WUI in the U.S. increased by 33 percent between 1990 and 2010, to about 190 million acres, according to a study published in March in the Proceedings of the National Academy of Sciences USA. The number of houses within the WUI grew by 41 percent in the same period, an addition of nearly 13 million new homes. 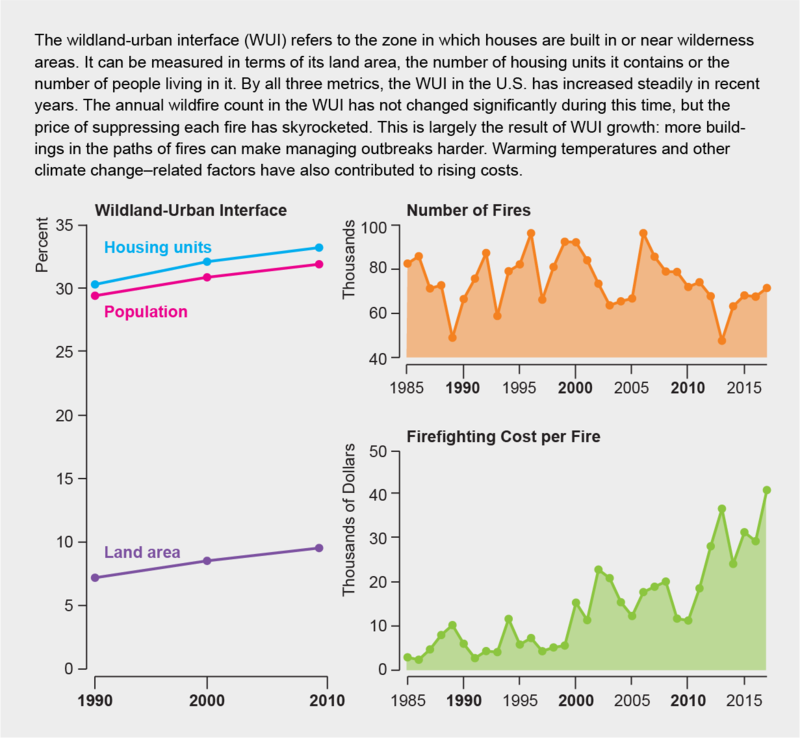 Having more structures in the WUI increases not only the damage wildfires inflict (because they are harder to fight) but also the risk that they will break out in the first place. “The Forest Service is concerned about more and more houses built in and near wildland vegetation because of this double whammy,” says the study's lead author Volker Radeloff, a forest ecologist at the University of Wisconsin–Madison. Sonoma County was sparsely populated when the Hanley Fire struck in 1964. But thousands of people settled there in the following decades, eager to live out their vision of the American dream, complete with a backyard and white picket fence. Nationwide, the total WUI now comprises an area larger than Washington State and includes approximately one in every three houses. This trend may reflect homeowners' desire to be close to nature, but wildfires in this kind of landscape pose a greater threat to people and to the economy than they do elsewhere. Between 1990 and 2010 the U.S. population grew by 60 million, and the nation added nearly 30 million homes, but it was previously unclear how much of that increase occurred within the WUI. Nor was it clear whether WUI growth was the result of the construction of new homes or of the recovery of natural ecosystems alongside areas that had already been developed. In the new study, Radeloff and his team combined census data with satellite imaging to quantify WUI growth since 1990. Understanding why and how the WUI expands is critical for evaluating wildfire-management policies, especially given the tremendous economic burden such fires impose. The number of acres burned by wildfires each year has increased slightly over the past few decades, but the amount of taxpayer dollars that federal agencies spend on fighting them has grown sharply. In 2017 that bill ran to $2.9 billion—$2.4 billion of it footed by the U.S. Forest Service alone. Although the agency's fire-suppression costs have more than tripled since the early 1990s, its budget has not kept pace. “If they're spending a significant chunk of their [total] budget on fire management, they're not spending it on other things,” says fire ecologist Jennifer K. Balch of the University of Colorado Boulder, who was not involved in the study. For example, lands managed by the Forest Service contribute around a fifth of the nation's water supply; for California, they contribute almost half. Focusing its resources on firefighting leaves the agency with less money to maintain and restore watersheds. “We now have lots more people literally living in the line of fire,” Balch adds. “Are people expecting federal agencies like the [Forest Service] to protect all these homes? If that's the case, then we really have to think about our dedicated budgets for fire-suppression costs.” Balch notes that the WUI's growth is accelerating, with no sign of slowing down. “In a lot of places in the U.S., it's not a question of if; it's a question of when will that home be exposed to wildfire,” she says. Although there are steps that homeowners and developers can take to mitigate that danger (such as using more flame-resistant construction materials and making more appropriate landscaping choices), Radeloff says municipal leaders need to begin incorporating fire risks into their plans. Rather than attempting to prevent fires from occurring, perhaps it is wiser to anticipate those that are inevitable. Communities can be more fire-adapted by resisting the temptation to allow building on high-risk plots, he argues—“and that hasn't happened yet, at least not at broad scales.” This is unfortunate, Radeloff says, “because we know that fires will continue, and climate change will bring weather conditions conducive to large fires more frequently in the future.” Various solutions to the problem of building in the WUI have been proposed, but to date none have stopped people from tempting nature's fiery whims.